Setup Area: 25x35 foot level area is needed for setup. 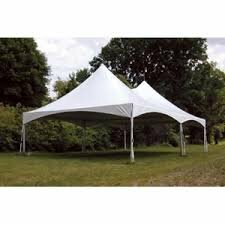 Add a touch of elegance to your event with one of our high peak, commercial grade tents. These tents use tension cross cables instead of a center pole, providing more space and creating an open look. Perfect for weddings, graduations, and more! Optional add-ons include sidewalls, lighting, and heating... call us for pricing. For soft surfaces such as grass, we secure using stakes driven into the ground. Customer is responsible for having any utility/ sprinkler lines clearly labeled prior to install. For hard surfaces such as concrete, we use concrete weights or water barrels to secure tent. Additonal charge applies to hard surface setups due to weighting requirements.